The IDOM (like “item” but with a “d”) label was founded by Modi Soondarotok and yes she's been featured here before. She's the proud shop owner of IDOM, the Portland-based fashion boutique specializing in fashionable clothing but somehow still manages to find time to design beautiful clothes!?! 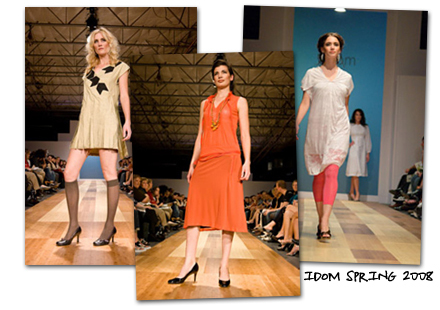 Read more about the IDOM shop here. 1. Tell us about your last collection. What was your design philosophy? The Spring 2008 collection was inspired by Le Corbusier’s building Villa Savoye in Poissy near Paris. The building was very modern in the 1929’s. It is still very modern today. The collection is simply trying to capture the spirit of the structure. Simple yet complicated. Using his defined lines of the building as inspiration. The colors are more muted in black, white, gray with some splash of pink, purple, and orange. The Hill Tribe people of Northern Thailand influenced the hand-embroidered pieces of this collection. My design philosophy is always trying to make women feel beautiful, confidence, and comfortable in the clothes. I’m such a fan of anything with interesting texture, volume and something unexpected. My inspirations can come from anywhere. Sometime from music, films, paintings, buildings or nature. The designing process is the best part! See more photos from the shoot here and behind the scenes at the IDOM underwater shoot! 2. Are you a slave to fashion? A shopaholic? Or do you prefer to focus on designing and creating for others? I absolutely love clothes. I truly enjoy looking at other people’s work. I’m not so much of a shopaholic. I would have to really fall in love with a piece to make that investment. I usually find things unexpectedly. I never really plan an actual shopping trip. I often buy things while I’m traveling as well. Chunky necklace from Israel, big silver cuff from Laos or a strange plastic belt from Japan. However, I do prefer to focus on designing and creating for others. This is a very tough question. I admired so many designers for different reasons. So hard to pick just one. Well, I adore Yohji Yamamoto and his design sensibility and his technical ability to construct very complicated garments. His works are like beautiful modern buildings. He is very much an architect of clothes. I also love Dries Van Noten, Balenciaga, and Hussein Chalayan. 4. Are there any up-coming designers that you currently admire? When I was studying in Paris I felled in love with Isabel Marant’s collection. Her clothes are wonderfully designed and so flattering and comfortable. Her style is very beautiful and chic. She is getting more fans in the states now. 5. Do you have a fashion icon? Yes, Iris Barrel Apfel is my role model. She has such a unique style and does her own thing. There are no fashion rules in her world. She is the first one to combines her high-end piece from Ralph Rucci with a piece from H & M. She has always been mixing high and low fashion, a Dior couture with a flea market finds. She is a big collector of textiles and accessories from all over the world. The way is put an antique Zuni belt with a Dolce & Gabana striped leather trousers. Her style is so brilliant! 6. Is there anyone you'd like to dress? Which celebrities would you love to see wearing your clothes? Charlotte Gainsbourg, a French-British actress/singer. She has the most wonderful personal style. This is so wonderful! What a great interview, lovely pieces(I adore that Jessie necklace)and what a great idea for a shoot! Thank you and off to check out more about the lovely designer! Thank you so much for such a lovely interview. I really appreciated your interest in IDOM. I love your layout and all the graphic that you designed. Your questions were so great as well. Thank you very much for this wonderful opportunity.